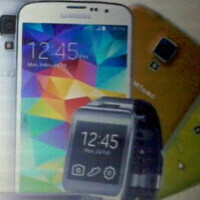 Samsung Galaxy S5 mini to be named the Samsung Galaxy S5 Dx? Samsung's own website apparently has a different moniker for the Samsung Galaxy S5 mini. According to the manufacturer's U.K. site, the bite-sized version of Samsung's flagship model will be known as the Samsung Galaxy S5 Dx. From the website's URL, we can see that the phone has a model number of SM-G800, which is the same model number we've seen used to represent the Galaxy S5 mini in other circumstances. Master leaker evleaks was able to grab a screenshot of the Samsung website before the image was taken down. With the inclusion of the Samsung Gear and the Gear Fit on the website, it surely looks like the Korean based tech titan is planning on marketing the Galaxy S5 mini Dx with these wearable accessories. Evleaks also tweeted a rather low-resolution picture of the 4.5 inch Galaxy S5 Dx all by its lonesome. The phone will get to share the IP67 certification of the full-sized Samsung Galaxy S5. That means that the device can be submerged in up to 3.2 feet of water for as long as 30 minutes, without sustaining any damage. Is the Samsung Galaxy S5 Dx the Galaxy S5 mini? "S5 Jr" = no thanks. Even if Samsung unlocked the bootloader and made KNOX optional. Don't want a small phone with specs from 2011.